Stop if you’ve heard this one before: the Democrats are serious about going after U.S. Rep. Vern Buchanan, R-Fla. It seems that every two years, the Democratic Congressional Campaign Committee (DCCC) takes aim at Buchanan and the 2020 election cycle is apparently no exception. This week, the DCCC included Buchanan on its “2020 Retirement Watch List” which includes Twitter ads targeting the congressman. Unlike the only other Florida Republican on the list–freshman U.S. Rep. Ross Spano–Buchanan has been in the minority before. He was elected in 2006, just in time for U.S. House Speaker Nancy Pelosi, D-Calif., to claim the gavel for the first time. 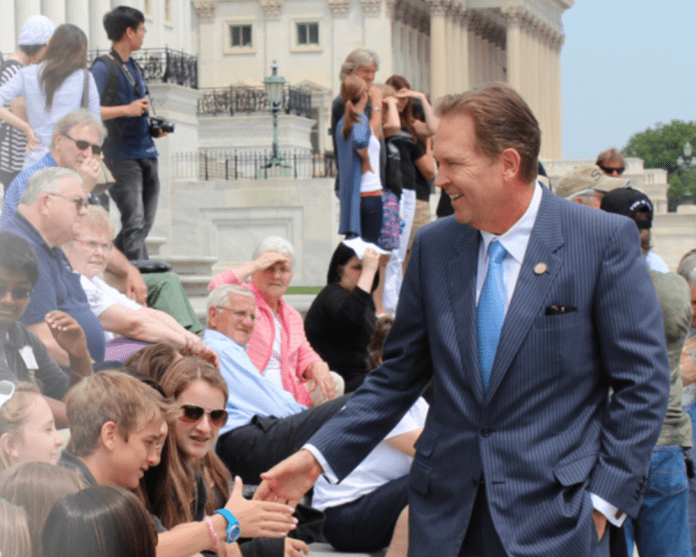 Since then, Buchanan has easily been one of the most active members of the Florida delegation, weighing in on everything from red tide to animal rights issues. He’s also been one of the most effective representatives from Florida and his efforts have only been boosted with key assignments like seats on the U.S. House Budget and the Ways and Means Committees. Buchanan is 67 and, of course, he could retire from Congress. But if he does, it won’t be from pressure from the Democrats. Consider his district which includes all of Manatee County and parts of Hillsborough and Sarastoa Counties. Republicans made up 41 percent of the district last year while 32 percent of the voters there were Democrats and 27 percent had other registrations. That being the case, Democrats have a tough time there. Take last year for example. After Buchanan’s son lost a special election to represent parts of Sarasota County in the Florida House, Democrats had high hopes for David Shapiro, an attorney who ran an impressive campaign against the congressman. Shapiro even got a boost from the DCCC. When the smoke cleared, Buchanan took 55 percent of the vote while Shapiro garnered 45 percent. Shapiro improved on the performance of Buchanan’s 2014 and 2016 challengers but still could not catch up even in a great election cycle for Democrats. As for Buchanan’s son James, he bounced back to win another state House seat to represent different parts of Sarasota County. In retrospect, the best chance Democrats had for taking Buchanan down in recent years was after redistricting in 2012 when former state Rep. Keith Fitzgerald came close but still fell short, losing to the Republican by 7 percent. President Donald Trump might have hindered Buchanan to some extent in November but the president the congressman should easily outpace his fellow Republican. Back in 2016, Buchanan ran over Democrat Jan Schneider, besting her 60 percent to 40 percent. Trump didn’t do as well in the district though he still outpaced Hillary Clinton there, beating her 53 percent to 42.5 percent there. Expect Buchanan to outpace Trump again in 2020. If Buchanan runs for another term in Congress, barring something catastrophic, the best Democrats can hope for would be to keep him occupied at home and force the GOP to spend money to defend the seat that it could have used in other races. In other words, 2018 all over again when Buchanan kept his seat by more than 10 percent. Kevin Derby, who wrote this analysis, can be reached at Kevin.Derby@floridadaily.com.